I have a history with Oprah Winfrey. 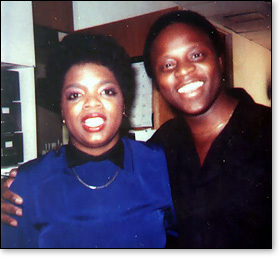 Back in the eighties, Oprah and I worked at WJZ-TV, an ABC affiliate TV station in Baltimore. Oprah was co-host with Richard Sher of the local morning talk show, "People Are Talking." I was a Graphic Designer in the Creative Services/Art department. The late famous psychic, Jeane Dixon was a guest on our morning show. After the show, Dixon read Oprah's palm. She predicted Oprah would achieve incredible fame some day. Dixon read my palm also and saw nothing. I am not saying psychics are real or unreal, I am simply telling a true story. I admired Oprah because she was a 'paradigm breaker.' According to the WJZ-TV employee rumor grapevine, certain power elites at WJZ-TV were unhappy with the hiring of Oprah. They said she was unattractive and not too bright. I love people who ignore what people say they can or can not do. Oprah was a heavy set dark skinned black woman on TV. With the exception of playing a maid, that was unheard of in the 80s. Also, blacks on TV seemed obsessed and pressured to prove to white America they were intelligent and articulate. Oprah was confident enough to simply be herself and people gravitated to her. Here is how Oprah got to Chicago and became, "Oprah." "People Are Talking" associate producer, Debra DiMaio was seeking a new position at a TV station in Chicago. After reviewing DiMaio's reel (industry term for resume video) the Chicago producers fell in love with Oprah; and the rest is history. Upon hearing Oprah acquired a new job in Chicago, we, her fellow employees at WJZ-TV, planned a surprise going away party for Oprah. Barbara Hamm, a producer gathered footage of Oprah on air over her years at the station. I parodied the classic, "You Made Me Love You" to write a song to Oprah. News video editor Commodore Hill used footage gathered by Barbara and my Oprah song to produce a beautiful and emotional tribute farewell music video for Oprah. We played it at her farewell party. There wasn't a dry eye in the house. It was a huge hit. Oprah wrote me the following thank you letter. As you probably know or maybe don't know, I am a big Diana Ross fan — when I was a little girl growing up in the ghetto with only dreams for companions — I wanted so much to be Dianna Ross or just somebody's supreme. But I want you to know had THE Diana Ross sang the "Oprah Song" — it would not have meant as much to me as having you do it. Not only was the song beautiful but — I felt it was also sincere. I was so moved and will never ever forget it — or you. Just as I know that it is indeed the master's Hand that keeps me from falling — and that he has laid his hands on me and that is why I am so blessed. I know Lloyd that you too have been "chosen." You're a very special person. Your light so shines that we all can see. Thank you for your support — I know there is much joy ahead for you. Without question, Oprah has done tremendous good, touching the lives of millions in a positive way. And for this I salute her. Because she has such a huge heart and compassion, Oprah tends to take the emotional liberal side of issues. However, though well intentioned, ignoring reality and human nature can be extremely destructive. A common theme on Oprah's show is everyone is a victim of somebody or something. All abusers are not the products of abuse. History proves some people are simply evil and some people are lazy losers. And why in almost 25 years of broadcasting have we not seen one conservative, "I am not a victim of white America" black guest on the Oprah show? This is a huge disservice to black America. We blacks, I am black, are blessed to be born in the greatest land of opportunity on the planet. And yet, liberal icons are still filling the heads of black youths that they are victims of a sexist, racist and homophobic America. Despite Oprah being close to if not the richest woman in America and America electing it's first black president, the branding of Americans as racist is stronger than ever. So Oprah, my dear friend, I challenge you. You have announced your program will end in 2011. How about doing a wonderful thing for not just for black Americans, but all. In your remaining programs invite black conservatives to appear as guests. May I suggest a few? Chris Gardener, whose life story is topic of the hit movie, "The Pursuit of Happyness." Will Smith portrayed Gardener in the movie. Thomas Sowell is a brilliant American economist, social commentator, and author of dozens of books. Walter Williams is a syndicated columnist and Professor of Economics at George Mason University. Oprah these are "non victim minded" extremely successful blacks America should meet. Who could better introduce these great black American role models than the great, one and only Oprah Winfrey?